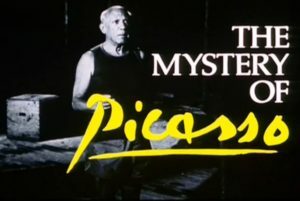 There’s a scene in Henri-Georges Clouzot’s Le Mystère Picasso, a 1956 documentary that shows the artist Pablo Picasso at work. The artist starts with random lines, splashes of color. There seems to be no method in what he’s doing, but as he paints, the details coalesce, but just as everything seems to come together, something goes wrong. This entry was posted on Friday, February 10th, 2017 at 6:21 pm and is filed under Uncategorized. You can follow any responses to this entry through the RSS 2.0 feed. You can leave a response or trackback from your own site. Powered by WordPress and delivered in 0.200 seconds using 45 queries.